TO MARK the end (for now) of the popular Class 442 ‘5-WES’ EMUs in regular service, the Branch Line Society organised a farewell tour of Southern Region lines with Nos. 442402/408 on March 11. 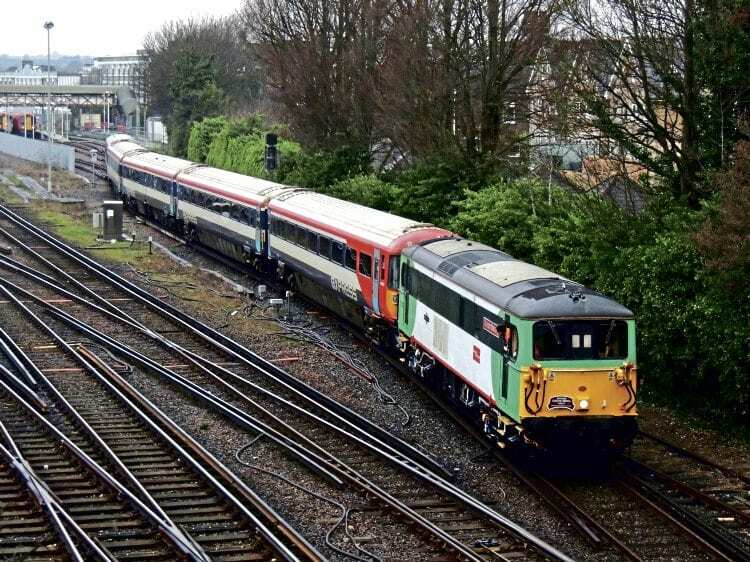 The ‘Southern Class 442 Farewell’ tour incorporated a number of rare Central Section loops and non-passenger lines, including a visit to Hove Yard and Lovers Walk depot in Brighton. For this section of the tour, the two EMUs were split and No. 442402 was accompanied by Southern’s only Class 73 electro-diesel No. 73202 Graham Stenning. Southern’s six remaining Class 442s lost their final remaining peak-hour duties during March, and all 24 five-car sets are now stored, many at the Potter Group site in Ely, awaiting further use. Eighteen are earmarked for complete refurbishment and a return to use with the new First/MTR South West Trains franchise from December 2018. This will see the ‘442s’ return to SWT, albeit on the Portsmouth line rather than their original Weymouth route.